Humanizing Big Data - A Book Review - Eric D. Brown, D.Sc. I received a review copy of Humanizing Big Data by Colin Strong a few weeks ago. 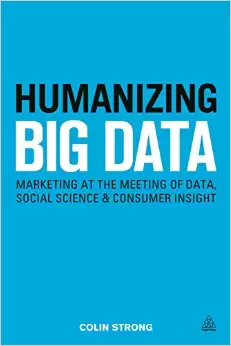 The subtitle to the book is “Marketing at the meeting of Data, Social Science and Consumer Insight”….that should give you a good feel about the contents of this book. It isn’t a heavy duty data science book…it is targeted more at folks in the marketing world to allow them to better understand the types of data that they may encounter as well as understand how that data might be analyzed and used within their business. Many times the term ‘big data’ can cause fear in non-tech and/or non-data people. The term sounds so vague and so ‘big’ and can cause people to steer away from big data. This is unfortunate because the size of the data doesn’t really matter – only the data, the context of the data and what you are able to do with the data is what matters. This book helps to remove some of the fear that might come along with big data. This book takes the user through an introduction of big data and how marketers (and others) can use many different types of data to better understand their customer base, their marketing efforts and their business. The author does a very good job describing how the reader could use existing data combined with other data gathered from social media and user-generated content. The great thing about this book is that you don’t need to be a marketer to get value from it. Just about anyone, including social scientists, financial analysts and others can find some value within this book. I strongly suggest this book for anyone looking to learn more about big data. Pick up your copy of Humanizing Big Data by Colin Strong today. How does he define ‘humanizing’ and how transactional is his approach to developing that context?